Deadline to register is May 14th! Re:Fuel Camp (May 28 - June 1): REGISTRATION IS NOW OPEN! For students that have completed 6th through 12th grades. The cost is $199 per student. A $75 deposit due at registration. It is time for Family Dedication on February 19th. If you have a child that needs to be dedicated you can REGISTER HERE**. On Sunday, January 1st, there will only be the 9:45 & 11:00 am services. No 8:30 service. Hope you have a blessed New Years! On Wednesday, November 23rd, the church offices will be closed, and there will be no Midweek Service. Have a great Thanksgiving! Light the Bluff is a community event on October 31st from 5-8. There will be candy, games, jumps, and food. Bring your friends, family, and neighbors. Preacher's new Sunday series "The Heart of Giving" starts October 16th. Preacher's new Midweek series "The Power Of My Words" starts September 28th. "If I can, You Can"
Clay Dyer was born on May 23, 1978, without any lower limbs, no arm on the left side and a partial arm on the right. However, these limitations did not dampen his determination and positive spirit. Clay began fishing at age 5. A natural competitiveness became evident early. Clay never allowed his physical disabilities to be an obstacle and began competing in fishing tournaments at age 15. He became a professional angler in 1995 and fished in the “major leagues” on the FLW Tour for 4 years. Clay’s television appearances include ESPN, Fox, CNN Headline News, Versus, the Outdoor Channel, Fox Sports South, the 700 Club and CBS. Published articles about Clay have appeared in USA Today, Newsweek, Bassmaster, FLW Outdoors Magazine, and many more. For more about Clay Dyer. It is time for Family Dedication on October 2nd. If you have a child that needs to be dedicated you can REGISTER HERE**. Hey college students! Join us for this year's College Retreat. Come hang out while you prepare for the fall semester! May 15th we start a new series titled RESPONSE. Join us for this 30 day journey which is our response to Jesus. Midweek in the Bluff this Wednesday is our student led graduate recognition service. Congratulations to all of our graduates, we look forward to honoring all of them in the service. Service Times are at their normal times - 6:30. We hope to see you all there. Summer camp is right around the corner! Click below to see whats happening at Dry Creek this year! Re:Fuel Camp (May 29 - June 2): REGISTRATION IS NOW OPEN! Early-bird cost is $175 per student before May 1st. Regular cost is $189 per student after May 1st. $50 deposit due at registration. We have two Christmas Eve services this year Wednesday the 23rd, and Thursday the 24th. Child care will be provided on the Wednesday service, but we will not on the Thursday service, so that our workers can all attend that service. The church offices will be closed on Monday, Thursday, and Friday for Thanksgiving. Give thanks for all you are thankful for! There will be no Midweek service or meal. Have a great Thanksgiving! Psalms 107:1 Give Thanks to the LORD, for he is good; his love endures forever. We will observe the Lord's Supper on Wednesday, October 21st after the midweek sermon. Please join us for a 5 week study! September 13th we began our Operation Christmas child campaign. As a church, our goal is to pack and send 4,000 boxes this year. Each shoebox we send gets the gospel message to 10 people. Join with us this year as we use these shoebox gifts to reach the uttermost parts of the world. Packed shoeboxes are due the 3rd week of November. Family Dedication is September 6th, so mark your calendars! If you want to be a part of this, the deadline to register is August 26th. 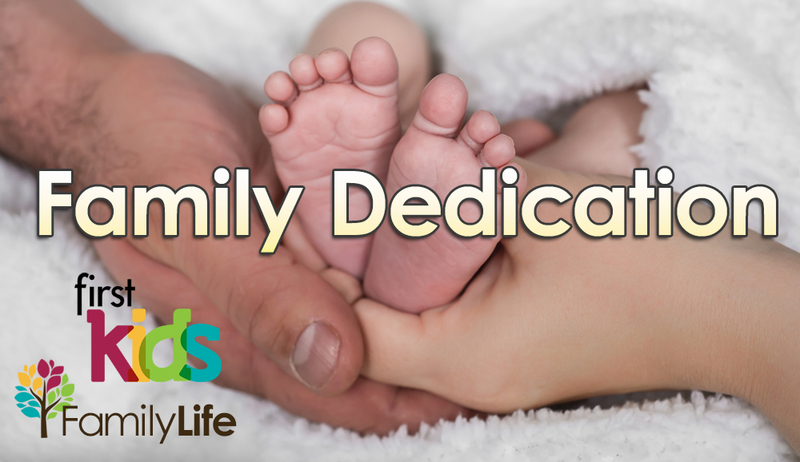 If you are interested, visit our family dedication page here to find out more. September 6th - The BIG DAY! Family Dedication.